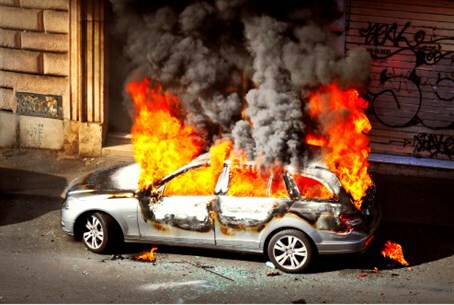 A known criminal's car was blown up on Geva Street in Netanya. Emergency medics arrived on the scene and determined the death of the driver. An unidentified man was killed Wednesday afternoon in a car explosion on Geva Street in Netanya. Rescue crews took the man out from the burning car, already dead. A preliminary police examination revealed that the car, a BMW, belonged to a senior criminal in Netanya, who was not inside the vehicle at the time of the explosion. But a second man in the car did manage to flee unharmed, according to eyewitnesses. Police believe the incident to be an underworld-linked assassination attempt. Magen David Adom emergency paramedic Adi Varshilevsky, who arrived on the scene, said: "In the middle of the road was a private vehicle on fire. A man was trapped inside the vehicle. Immediately after extinguishing the fire, when it was possible to get closer to the car, we saw that he had been killed on the spot and we determined his death." Also at the scene were Internal Security Minister, Yitzhak Aharonovich, and the district commander Brigadier General Kobi Shabtai. There has been an escalation of violent attacks and assassinations between Israel’s organized crime gangs in recent years, prompting the 2008 establishment of the Lahav 443 police unit dedicated to combating organized crime.